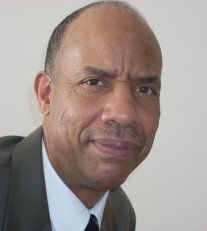 I'm Terris Muhammad, founder of Terris Worldwide, Consultant For Business Excellence. Welcome to our website. First, I will tell you about my educational and business background. Then I'll tell you some things about me personally that will help you get to know Terris Muhammad. The original founder(s) of any organization is the principal person that sets its culture and practices. Terris Worldwide isn't any different. When I conceived Terris Worldwide as a business consulting service I drew from a wealth of qualities and experiences that would have meaning for the people and organizations we serve. People need real answers to real problems. My intention is to give you real substance that will help you solve real problems. My academic, educational background is as follows. Waukegan Township High School graduate - Waukegan, Illinois. Illinois State University - Normal, Illinois. I did my freshman and sophomore years there right out of high school. University of Utah - Salt Lake City, Utah, Bachelor of Science degree with a major in philosophy. DeVry University - Addison, Illinois. I got a second bachelor's degree in information technology, client/server model in 2002. DeVry University/Keller Graduate School of Management - Oakbrook, Illinois: Master of Information Systems Management in 2004. DeVry University/Keller Graduate School of Management - Oakbrook, Illinois: Master of Accounting & Finance Management in 2005. DeVry University/Keller Graduate School of Management - Oakbrook, Illinois: Master of Business Administration (MBA) with a concentration in International Business, 2007. City Colleges of Chicago (Illinois). I dabbled with the idea of being a physician at one time, but even though that never happened I am thankful for the academic training. You might be saying to yourself that this guy sure loves education. That's true, but what I love more than education is research. Educational institutions are nothing but big research facilities. There are loads of books there, and people with endless experiences and information just waiting for you. If all you do is go to school to get a degree or certification, then you are missing the boat on what schools really have to offer. A degree in and of itself means little to nothing. Dr. Yosef ben Jochannan, an African professor of history posed a rhetorical question to us in a lecture at the University of Utah. He asked, "Did the first man that gave a degree have a degree?" He went on to explain that degrees are not what you should be seeking, but rather you should be seeking valuable, useful information and knowledge. That was a profound statement for me at the age of 20 years. Some of my meaningful business experience is as follows. Home Insurance Company (a division of AIG). TAM Carpet Cleaners Inc. - a company I started to provide home and light commercial carpet cleaning. T.A. Muhammad Publishing Inc. - a publishing company I started to self publish an African-American history book. Sales Manager with a Miller Freeman trade show organizer local agent that sold trade show space in international trade shows around the world. I got introduced to international business in this capacity. United Insurance Company (life and health insurance). Success Motivation Institute - founded by Paul J. Meyer (personal development). I hope I haven't left out any. I have been involved with so many network marketing companies, all with great products. 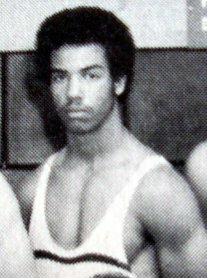 The picture at right is me during my sophomore year at Illinois State University as a member of the ISU wrestling team. I am good at virtually all sports, but chose wrestling in school because I could control my own destiny more. Growing up as a child baseball was my first love. I ate, slept, and breathed baseball 24/7. I played basketball and football as well in school. Some of the most influential people in my life have been athletic coaches. I still have a daily exercise regimen to stay fit. Oddly enough what I do now is more than what I did to stay in shape when I was in high school and college (as an undergraduate). Athletics was a big part of my life until I was about 21 years old. I developed some great skills, and made some wonderful relationships during my organized athletic involvement. The picture at left is me at three (3) months of age. 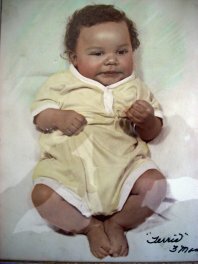 I am showing you this picture not to show you what a cute, adorable baby I was, but rather to give you some idea of the parents, family, and environment that nurtured me. What you see here is the product of Frank and Betty (maiden name is Cole) Speed, and my extended family. Sometimes we like to think that we are self made, all-powerful individuals, but we have to remember and reverence the wombs that bore us. I really had a wonderful childhood up until I was nine (9) years of age when my mother divorced my father and later suffered a mental collapse. At the age of nine I was forced to grow up fast and find answers to perplexing problems. Today, my mother can perform normal daily living tasks for her person, but otherwise needs someone to provide a home, etc., for her. My birth name is Terris Franklin Speed. I changed it to my present, Terris Adib Muhammad in my mid 20's for cultural reasons. My ancestry has a strong African history. I grew up in Waukegan, Illinois which is a northern suburb of Chicago, Illinois. We lived in Zion, Illinois which is right next to Waukegan for a couple of years. In my early years I had no idea one day I would become the Terris Muhammad I am today. When I was eight (8) years of age I got my first experience with entrepreneurship and sales. I ordered some flower seeds in a magazine on consignment, and sold them in the neighborhood. I remember getting the seeds. I was so overwhelmed that a company would send product to an eight year old. My mother, bless her soul, didn't ask any questions. She just handed me the box containing the seeds. Both my father and mother grew up on farms totally about 600 to 700 acres. My father was born in West Point, Mississippi. My mother was born in Pink Staff, Illinois next to Lawrenceville, Illinois. My early childhood was spent shuffling back and forth to family farms in Mississippi and central Illinois. Though I was born in an urban area I still consider myself a "farm boy." When I was 16 years of age I set out on a mission to gather all the significant knowledge that the world holds to learn how the real world works, and to advance the good within it. You see, as a child I experienced extremes of joy and sorrow. I wanted to capture the joy and peace, and make it a masterpiece for myself and others. I set a plan for my life from age 16 to 32. By age 32 I wanted to have accomplished my mission. All praise is due to God, I did that beyond my wildest dreams. During this period I found my true self, and became the Terris Muhammad that I am today. Hopefully, you have a feel for Terris Muhammad and the vision I have for this consulting practice. After viewing Terris Muhammad-About Me please click here to return to Home Page of Terris Worldwide.